In every Calcutta home, you find a flat slab of stone upon which fresh spices are ground by hand. It’s somewhat like a mortar and pestle, except that the mortar is flat and the pestle is held horizontally with both hands. My nani’s sharp eyed Bengali cook, Radha, clad in widow white with her sparse white hair knotted back in a severe bun, insists that using this grinding tool, the sil batta, is the only way to make a traditional Bengali fresh curry paste of cumin seeds, coriander seeds and fresh ginger root. Electric blades generate heat which change the taste of the paste she says. Also no matter how powerful the machine, the fibers of the ginger get caught in the blades and show up in later fibrous mouthfuls of food. In Calcutta, with plenty of kitchen help, I am easily persuaded. Here, in my apartment kitchen with no sil batta or even a decent mortar and pestle, I’m alone with my wet grinder and coffee grinder. I make compromises: ginger paste with a little water in the wet grinder and dry cumin seeds powdered in the coffee grinder. The coriander seeds yield to hand pounding in my molcajete. I combine them all for the wet paste of my earthy, aromatic Bengali mixed vegetables, called chorchori. 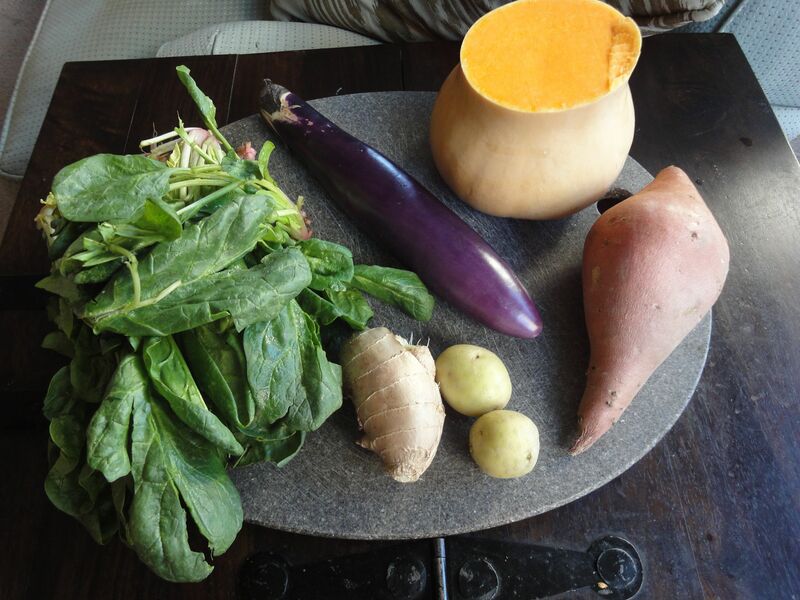 This colorful vegetable preparation uses lots of different vegetables that grow in Bengal: pumpkin, sweet potato, eggplant, pui or pohi greens (can substitute with spinach), white potato. Use what you have, but if you don’t have greens, add a splash of water: the greens give off water that allow the other vegetables to cook. The tempering of the oil, called tarka is a traditional Bengali one: the five spice mixture called panch phoran, a long red chilli and bay leaves. A pinch of sugar is a must in the wet spice paste. This dish tastes delicious rubbed into steamed white rice with your fingers along with sweet Bengali cholar dal. 1. Heat the oil and add the tarka spices when the oil is hot. Allow the panchphoran to sputter. Cook the wet paste for a few minutes. 3. Add all the vegetables, including the greens. Stir and allow to cook for half a minute. Cover and cook until vegetables are soft, stirring occasionally. When the vegetables are halfway done, add the dry spices. Taste for sugar and salt when the dish is done. Cook uncovered for a few seconds at the end, before removing from the heat. Serve hot. BTW, I tried chorchori last weekend. It was so yumm!! Took me back to the homes of all my Bong friends and their tiffin boxes!!! Though am not sure I used the right veggies. 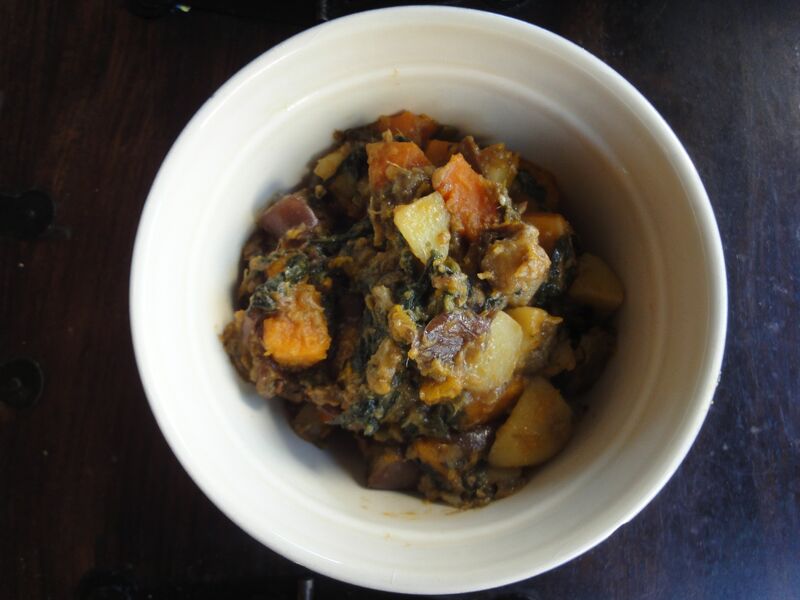 I used yellow squash and chayote instead of sweet potato and butternut squash. Any thoughts on the choice of veggies? I felt mine could have been softer and sweeter. It’s like pumpkin so you can use either.